Buy through MusicWeb for £12.25/13.00/14.00 plus postage. If one asks a lover of classical music who his favourite composers are few will volunteer the name of Corelli. Although he is generally acknowledged as one of the most influential composers in musical history, and according to eye-witness accounts one of the greatest violinists in history, his music is little appreciated and some even consider it boring and overrated. When in the 1990s Italian musicians started to play on period instruments they concentrated on Vivaldi's music rather than Corelli's. Even today there are only a handful recordings of his music by Italian interpreters. Corelli's oeuvre isn't very large: just six collections of music were published, the last - the Concerti grossi Op. 6 - after his death. But his music was reprinted frequently until the end of the 18th century. It is for sure that he wrote more than was printed. There are a number of sonatas without opus number, and we also know that he composed sinfonias which were used as overtures to oratorios by other composers of his time. These seem all to have been lost, except one. It is quite possible, though, that some of them have been included in the concerti grossi, probably reworked. Corelli was once considered the inventor of the concerto grosso, but that is contradicted by the facts. No composer can claim to be the inventor of the genre. In fact it came into existence at several places in Italy in the last three decades of the 17th century. The principle of the concerto grosso - the contrast between a small group of instruments, the 'concertino', and the 'ripieno', the full orchestra - was the answer to the habit of performing music with large orchestras, sometimes consisting of more than 100 instruments. Ensembles of that size obviously lacked flexibility, and a way to compensate was for a small group of instruments to be set apart, the 'concertino'. The set of twelve concerti grossi Opus 6 was published in 1713 by Estienne Roger in Amsterdam. It is very likely though that the concertos were composed some decades earlier. We know that Georg Muffat saw and heard Corelli direct performances of his concerti grossi in Rome in 1681-82. During the last years of his life Corelli was reworking the concertos and preparing them for publication. The set is divided into two parts: the first consists of eight 'concerti da chiesa', the second of four 'concerti da camera'. These titles do not refer to the place where they were performed. These works were certainly played in church, but probably more often in concert halls or in the open air. The titles indicate in what form they are written: the 'concerti da chiesa' after the 'sonata da chiesa', consisting of a sequence of slow and fast movements. The 'sonata da camera' contains a sequence of dances, usually preceded by a prelude, and so do the 'concerti da camera' in this set. In his performances in Rome Corelli also made use of pretty large ensembles, larger than those used in most modern performances. It seems that between thirty and forty musicians were involved in performances under Corelli's direction in the palaces of the Cardinals Pamphili and Ottoboni. On the other hand, it was also possible to perform concerti grossi with the concertino only - a practice Georg Muffat mentioned in the foreword of his Concerti Grossi of 1701. In that case the parts for the concertino were to be played piano to create a contrast with the ripieno sections. The booklet doesn't list the musicians involved in this recording, but as the set was originally released as part of a complete recording of Corelli's music, I have turned to that box and found out that ten violins are used, three violas, two cellos and a double bass. For the continuo group a harpsichord and a theorbo are always used, and in most concertos also the organ. From the sources and the witness accounts of Georg Muffat one may conclude that the theorbo was always involved in the realisation of the basso continuo part, the harpsichord much less. The involvement of the organ is unsure, whereas Muffat also mentions the harp. It seems to me the choice made here is strongly defensible. What I particularly like is that no distinction is made between the 'concerti da chiesa' and the 'concerti da camera'. There is no reason to use only an organ in the former and only a harpsichord in the latter. Considering that I was a little disappointed by the performances of the trio sonatas in the original set I am happy to report that these concerti grossi are a lot better. The ensemble produces a very beautiful and warm sound, which is extremely well recorded by the sound engineer. The recording took place in two churches. The church in Deventer suffers from reverberation which makes the orchestra sound somewhat bigger than it really is, but in the light of what we know about the size of Corelli's orchestra that is perhaps an advantage rather than a problem. I am generally satisfied about the tempi, although I find some movements a bit too slow - take the last allegro of the Concerto No. 1 or the second vivace from the Concerto No. 8. There is reason to believe, though, that Corelli's own performances showed larger contrasts in tempi between slow and fast movements. The recording of the Ensemble 415, directed by Chiara Banchini (Harmonia Mundi), probably comes closer to his own tempi. It is a shame Belder hasn't followed that example. Otherwise his interpretation has many virtues, among them the ornamentation in the concertino. The very good sense of rhythm is one of the most attractive aspects of this recording, which results in really swinging performances - for instance, the first allegro of Concerto No. 3 and the allemanda and corrente of Concerto No. 9. The contrast between the two sections of the closing allegro of Concerto No. 4 is well realised. The grave-andante largo of Concerto No. 2 is very expressive, and the players touch in some fine dynamic shades. 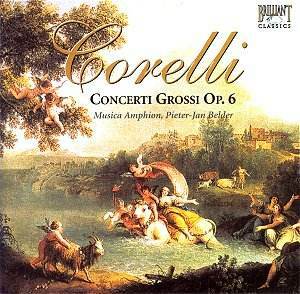 In short, this is one of the better recordings of Corelli's Concerti grossi. At budget price one can hardly go wrong with this set.